Literate women an change her life in terms of getting involved in income generation activities, enhancement of her self esteem and prestige, involvement in decision making process at family level and village level. The pros of getting literate can be innumerable. 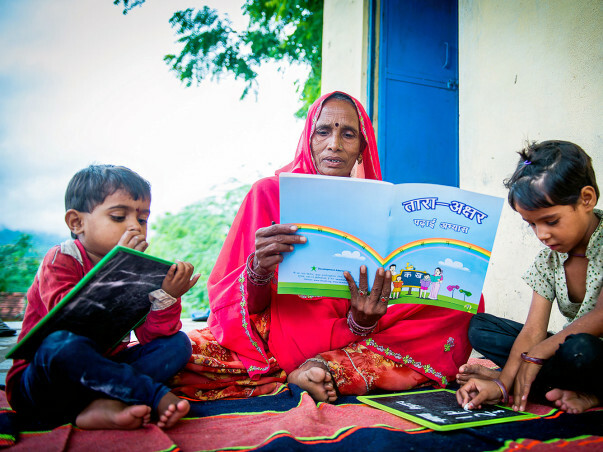 Making a women literate is equivalent to making a generation literate. Our TARA Akshar+ Programme is a Women Literary Programme, designed to teach illiterate women basic Hindi and numeracy in 56 days. After 56 days women undergo a post literacy programme called 'Gyan Chaupali' which is a very important part of TARA Akshar+. It has been introduced so that women can practice what they have learned in the first 56 days. Our campaign aims to raise INR 1,00,000 in next two months so that literacy can be provided to almost 17 women in remotest of villages. These 17 women will not only get knowledge about reading and writing Hindi and do simple arithmetic but will also be provided with resource material on women and child rights, how to fill forms, health and hygiene etc. We will introduce special workshops on Health literacy, financial literacy, setting up your enterprise for women in order to give them a holistic environment to learn. As a next step to literacy we will also try to get them trained in specific skills that can lead them to get employment. We have already worked in 8 states of India and made almost 1, 80,000 women literate. There success in life is a proof of success of our programme.